Submitted photo The Before I Die Wall encourages students to write about things they would like to do before they die. FAIRBORN — Inspiration for a unique interactive art exhibit at Wright State University came from a TED Talk for students in Communicating through Chronic Illness and End of Life, a special topics in communication course at Wright State University. Marie Thompson, associate professor of communication, thought the project would be a great way to discuss end-of-life care and communication with her students in the course. 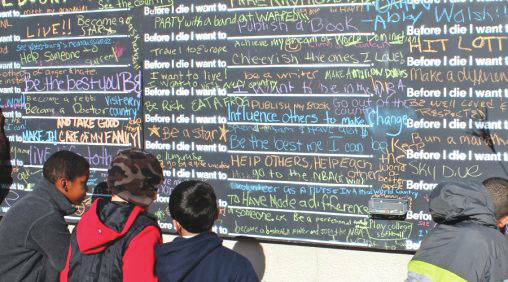 The Before I Die Wall encourages students to write about things they would like to do before they die. However, Thompson said, it is not a bucket list. The wall, which is a wooden box painted with chalkboard paint and the stenciled words “Before I die, I want to…” will be available around campus to students to write their answer. On April 5, 10 and 12, the wall will move around campus. Locations include the Quad, White Hall Atrium, Hamilton Plaza and Turning Points. If the weather is bad, each outdoor location has a corresponding indoor location, such as the Student Union, the Hangar and the White Hall Atrium. Students are excited about the wall project, taking to social media to advertise the wall and its location. They are using the hashtag #FindTheWall to encourage student interaction, as well as a Twitter account, also called @FindTheWall. “The wall is a way to engage our entire community in a conversation that, while we are most likely to avoid conversations about death and dying, our relationship with death is inevitable,” Thompson said. Thompson found inspiration for teaching the class through her affiliation with the Boonshoft School of Medicine’s Medical-Spirituality Conference. This year’s 10th anniversary topic is “The Soul Work of Living and Dying.” The conference takes place April 19 at the Sinclair Conference Center. Thompson has been taking students to the conference for the last six years, providing students with opportunities to learn about critical shifts in health/care and engage with health professionals from around the region and often the entire country. To prepare for the conference, students read two books of authors who will attend the conference. That way, they are prepared to meet them and discuss their books. https://www.fairborndailyherald.com/wp-content/uploads/sites/50/2018/04/web1_BID-Waterbury-CT-900×500-508×282.jpgSubmitted photo The Before I Die Wall encourages students to write about things they would like to do before they die. 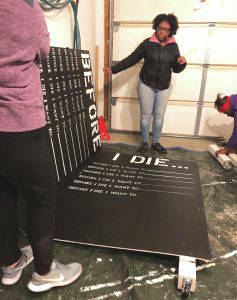 https://www.fairborndailyherald.com/wp-content/uploads/sites/50/2018/04/web1_Before-I-Die-1-237×300.jpgSubmitted photo The Before I Die Wall encourages students to write about things they would like to do before they die.